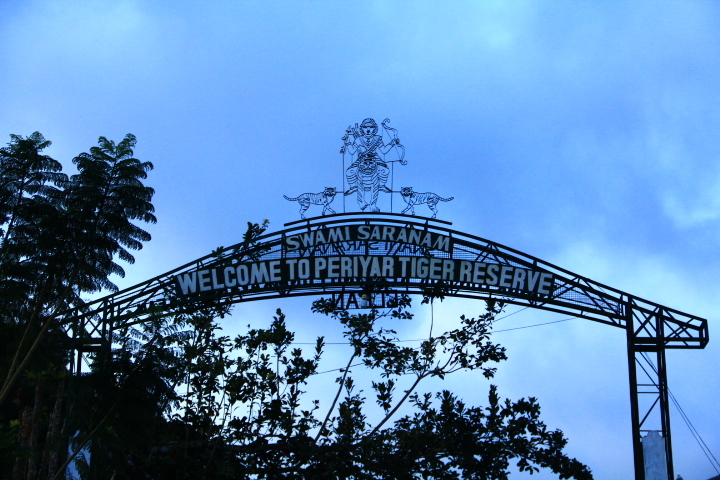 Last Tuesday I had a chance to go to Gavi, a village in the Pathanamthitta district of Kerala and part of the Periyar Tiger Reserve. It’s only a 45 minute trip from Cardamom County, but it’s a full day program that could go from 6 am to 6 pm –when the park gates open and close. Guests also have a choice of staying overnight. 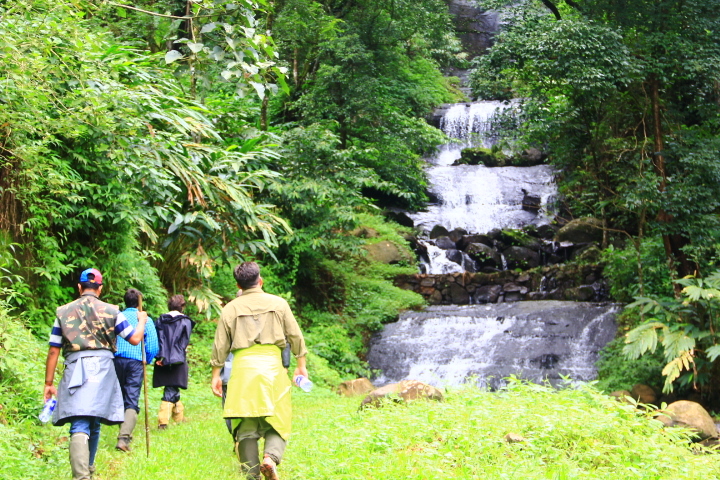 All programs are organized by the KFDC (Kerala Forest Development Corporation). In the morning, we met in front of the reception area around 5:15 in order to spend as much time as possible in the reserve. Including myself and the driver, we had a total of eight people for this trip. 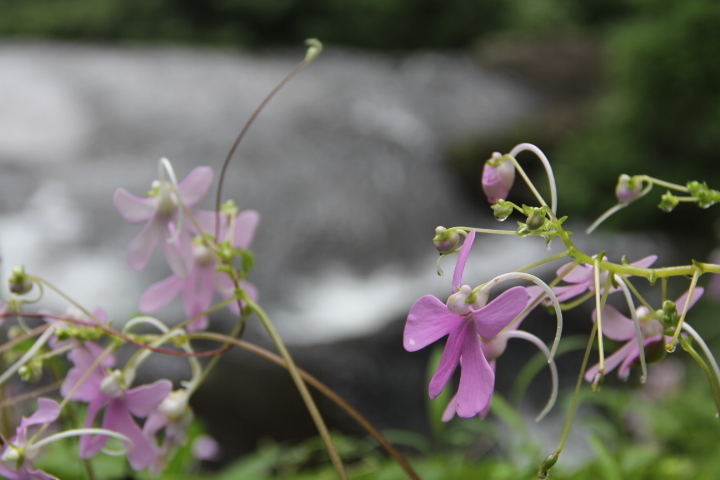 Our driver was Shahul, a usual driver who comes to pick guests up at Cardamom County. 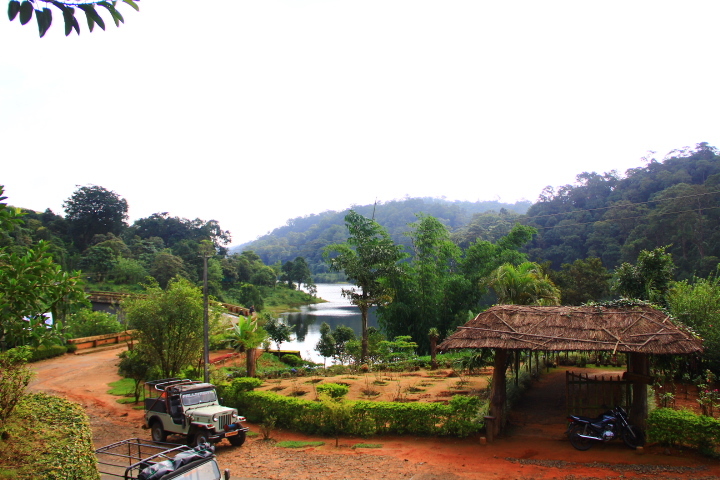 About 30 minutes later, we arrived at the Vallakkadavu entrance to Gavi. After paying the park entrance fee, we continued on the road deep into the reserve towards Green Mansion where the activities begin. 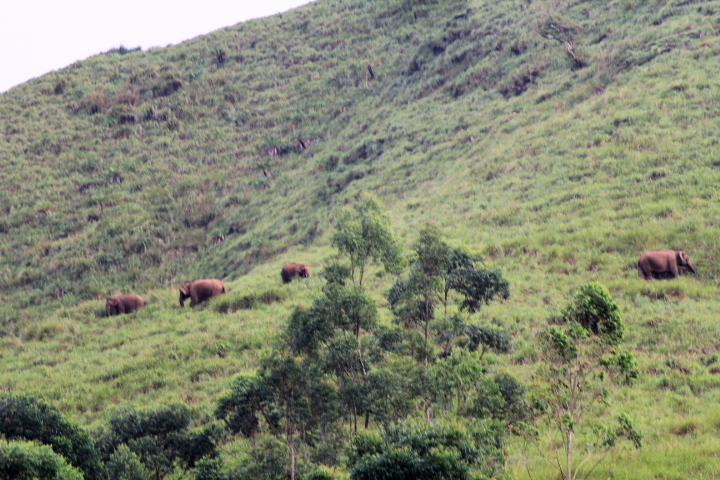 Within about 10 minutes driving on the Periyar road, we had our first wild animal sighting– elephants! Seeing elephants was very exciting but very sad at the same time. Michael, the first of three interns at Cardamom County and the creator of this WordPress site left Kumily on that same morning on the first stage of his long trip home. During his two month stay he’d been on numerous treks in the reserve but he never got to see an elephant, and within an hour into our excursion we got to see a small herd! It really drove home the fact that wildlife sighting is really a matter of luck. But that phrase should be viewed in two ways; it’s not just the luck of being in the right place at the right time, but also anyone who has the opportunity to spend time in a wild, natural environment should consider themselves lucky indeed, whether they have the good fortune of sightings or not. But back to our elephants. 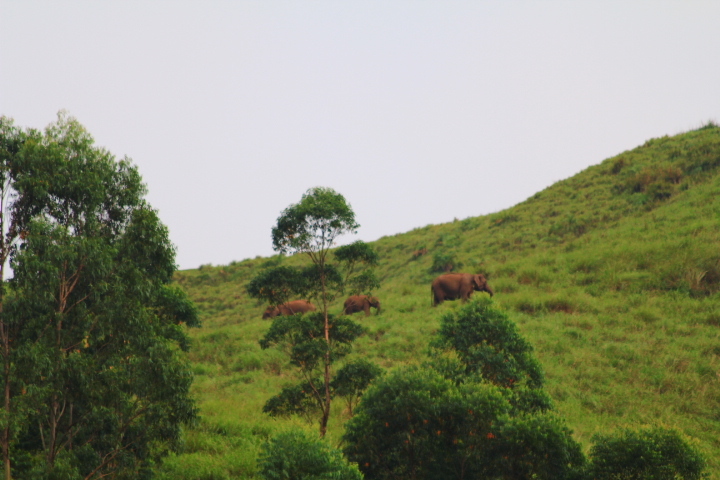 They were very far away but visible with the naked eye and the fact that I saw wild elephants was very exciting. 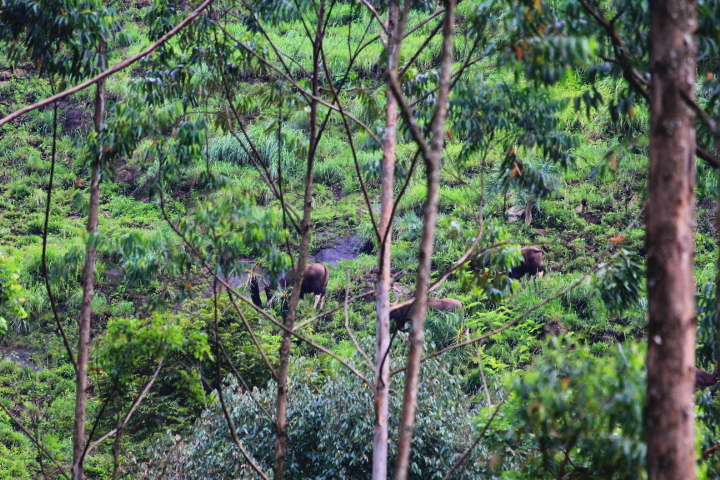 Further into the forest, we sighted wild Indian Bison also known as Gaur. In India, when you see a black bovine and have a hard time identifying Gaur from a black Cow or Buffalo, look for its white legs. 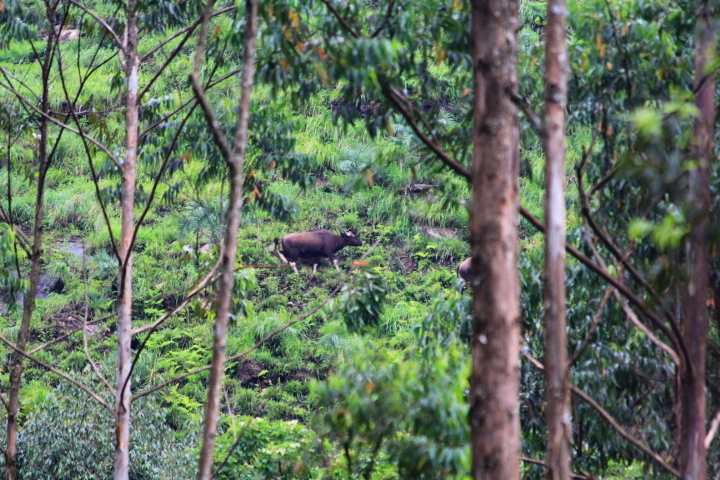 Here’s some quick information about the Gaur: Gaur is listed as a vulnerable species on the International Union for Conservation of Nature (IUCN) Red List since 1986. 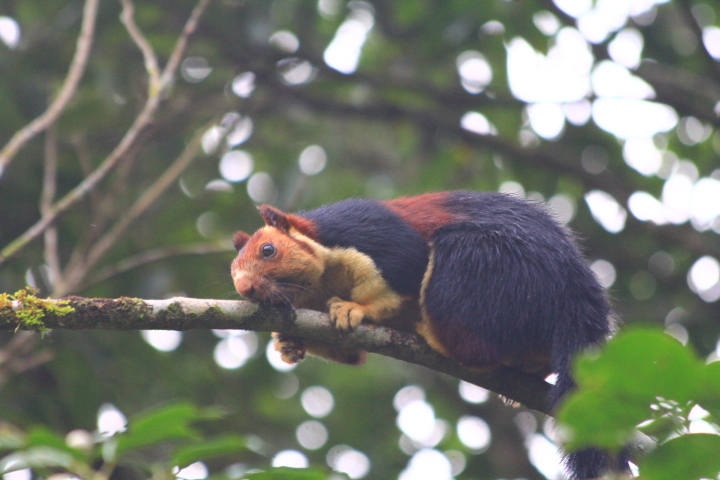 (Although they are quite numerous in the Periyar Reserve.) It is the largest species of wild cattle, bigger than the African buffalo and wild water buffalo. 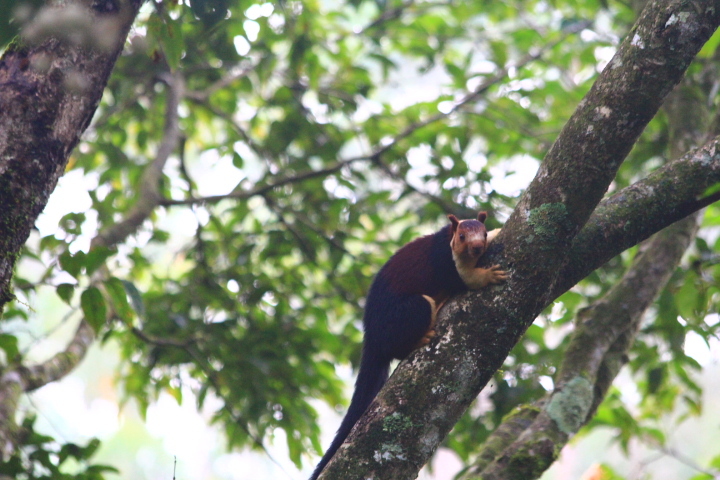 The next wild animal we had the good fortune to see was the Malabar giant squirrel, also known as the Indian giant squirrel. 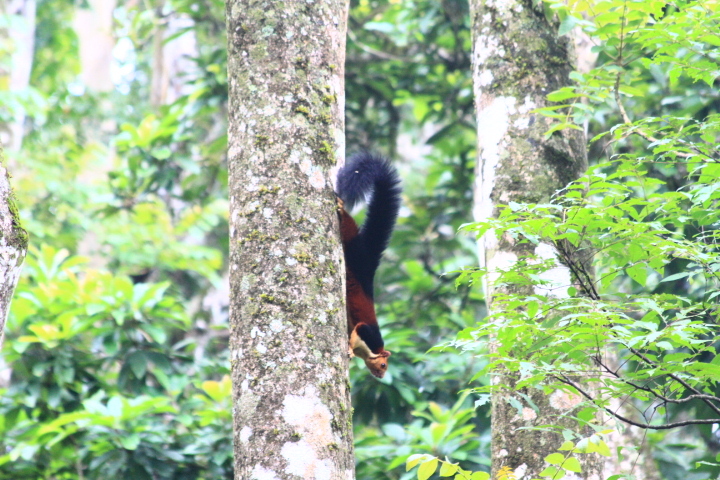 I saw this mammal before when I did a day trek in the Periyar Reserve near Kumily but it was too far to get a clear view or a picture of it. However, these particular specimens were very close to the road, which enabled me to take decent close-up shots of them. We also sighted Nilgiri Langurs, which have starred in several earlier posts: Unexpected Visitors, (Un)expected Visitors, Redux). 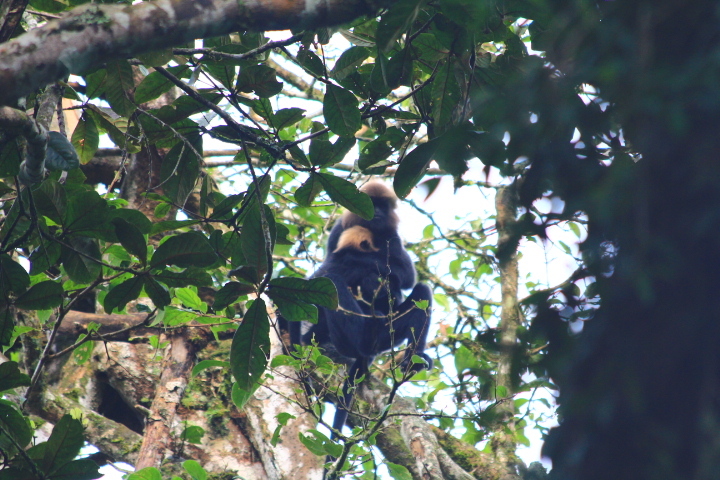 Even after having seem them at the property, a rare occurrence despite those posts, this time we were able to see a baby Nilgiri Langur–a very special sighting indeed, as they are usually very high up in the trees! Only about 10 minutes after this encounter, we arrived to the Green Mansion where meals are provided and other activities begin. 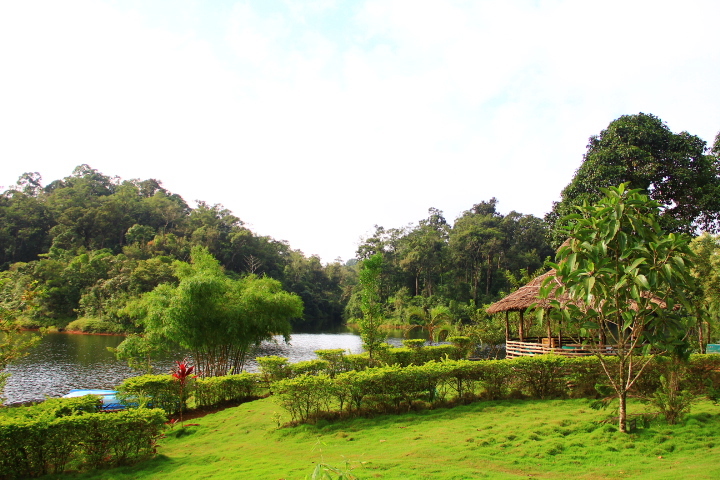 The Green Mansion is located right next to the Gavi Lake where the guests can do canoeing. 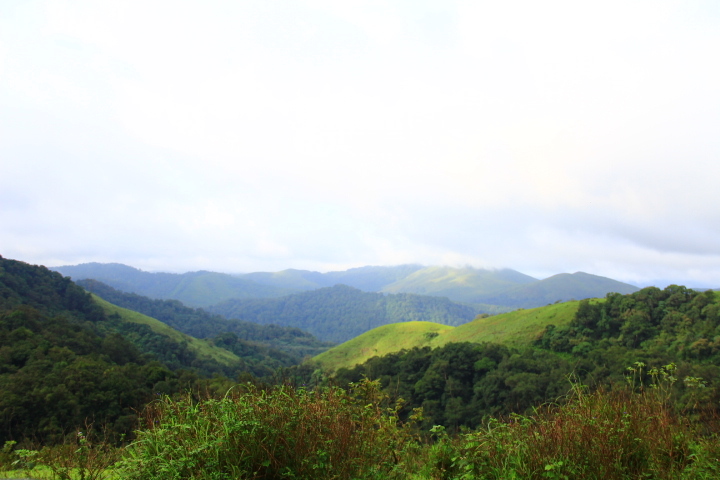 The scenery is just breathtaking and with no doubt one of the most beautiful areas I’ve been to during my stay in Western Ghats. The Green Mansion provides vegetarian food and snacks for the visitors and tree houses and pitch tents amidst the wilderness for overnight visitors. 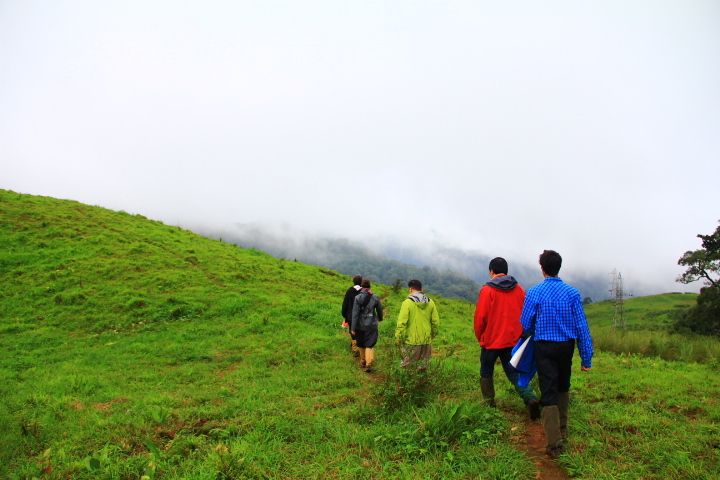 After breakfast, we set out for a three hour trek. 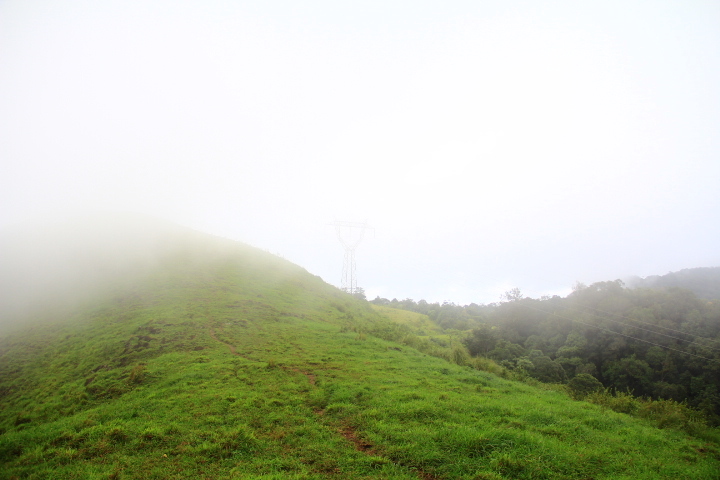 In the beginning, it almost felt like doing the Cloud Walk because of the weather and the altitude (this particular day, the cloud was very low). Hopefully in this picture you can just make out the little dirt path that we took. 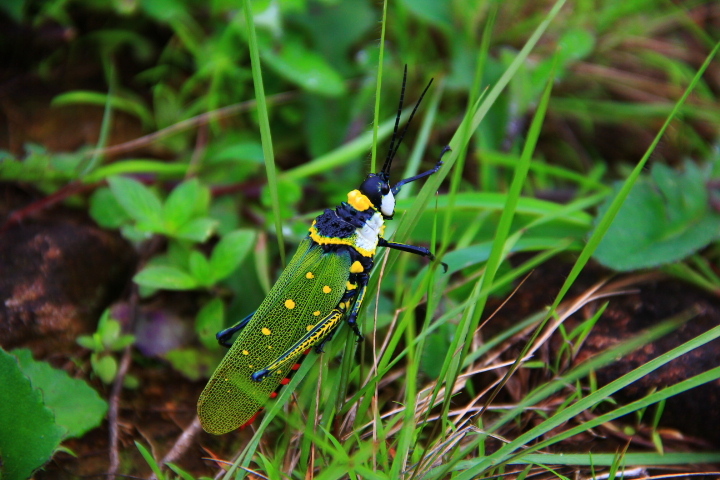 During the trekking we didn’t have the luck of more wild animal sightings but with our guide’s keen eyes, we were able to see a huge grasshopper. 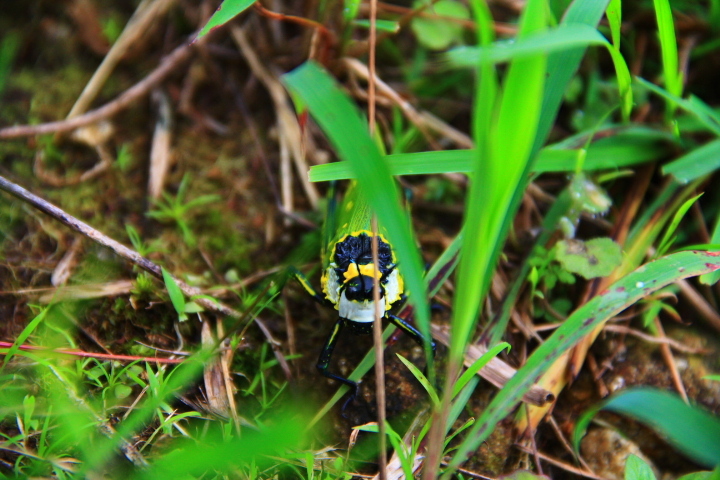 At first I couldn’t tell what the guide was pointing at until I looked closely (it camouflaged so well with the grass). 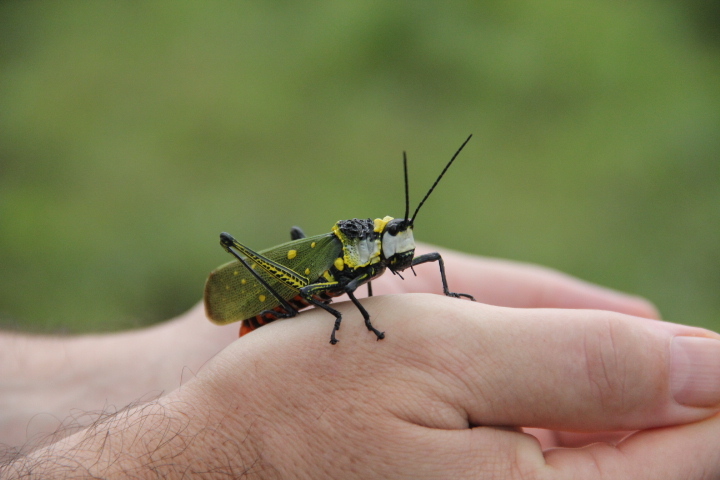 This was the biggest grasshopper I’ve ever seen! 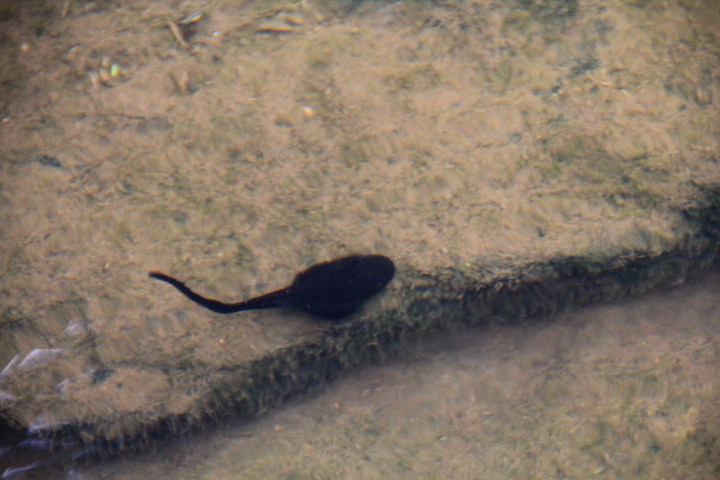 In a shallow stream there were very big tadpoles so I was hoping to see some frogs but they never appeared. 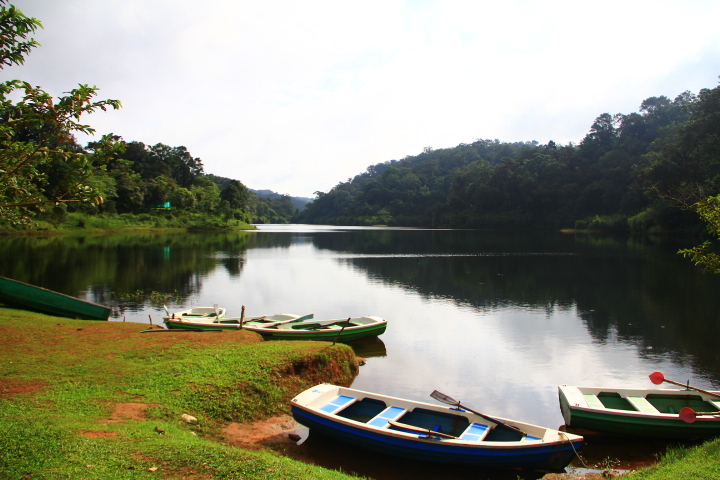 I think the trip to Gavi was one of the most exciting trekking I did in the Periyar Reserve. I felt totally enclosed in nature.